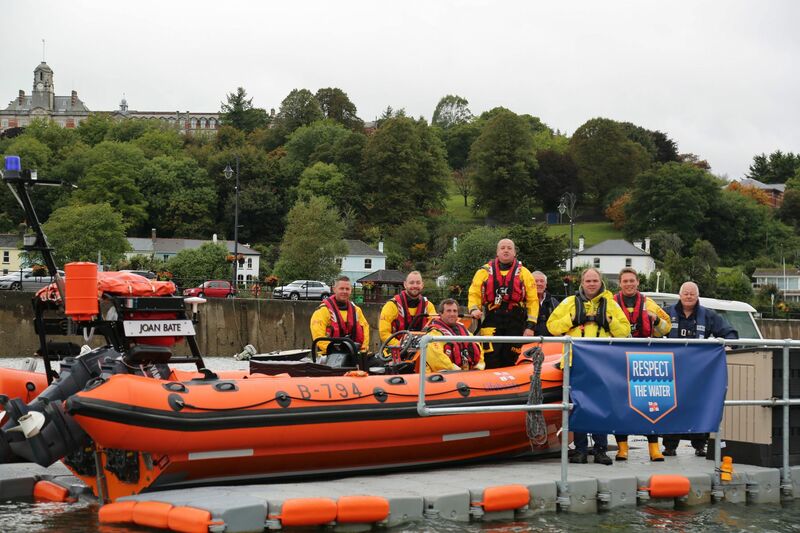 The trial of the Atlantic B class lifeboat in Dartmouth started in October 2018. The station has received a very positive letter from the RNLI concerning the Atlantic operations and training to date. Rob Clements said, “An enormous amount of work has been undertaken. Procedures will be reviewed every six months”. There is still Atlantic night time training to be completed by a few people. The Atlantic had five shouts in 2018. The first was to Start Point to a boat with a rope round its propeller. It took the Atlantic 14 minutes to get out there. Over the 22nd and 23rd December both boats, the Torbay all weather lifeboat, four shore teams and the coastguard helicopter were involved in a search for a missing local man. After his body was finally recovered the RNLI trauma team attended the station to support the crew. Over the New Year period there were gale force 9 winds in the harbour and it was uncertain whether the Atlantic would have to be moved from her berth on the Aquadock alongside the low water landing to a more sheltered position in a Marina. In the event she safely rode out the storm in her usual position. The station had 46 shouts in 2018, so it was our second busiest year. There have been seven launches so far this year. On the first of February the Atlantic lifeboat was launched to assist a 63tonne 75ft. yacht that had lost its steering just after they had lowered their sails and were motoring in past the Castle Ledge buoy. In the event the five man crew managed to set up a jury steering rig just after the lifeboat reached them. The volunteers escorted the huge yacht to a berth alongside the Town pontoon. Simon Crayfourd is a paid member of the RNLI staff and is based in Kingsbridge. As an Area Lifesaving Manager he has overall responsibility for Dart lifeboat station and is the manager for Mark Strudwick, our volunteer Lifeboat Operations Manager. The new lifesaving delivery areas are now in place: Last summer, the RNLI reviewed and identified some areas where the lifesaving area boundaries were not quite right. As a result some changes have been made to ensure the RNLI’s Area Lifesaving Managers (ALMs) are best placed to provide the most effective support. There are now 47 areas instead of 41, each with a dedicated ALM. It was recognised that many of our activities, such as training and cover for our lifeboats, depend on a close working relationship with the Torbay lifeboat station. For this reason Simon has now been given the responsibility to add the management of Torbay Lifeboat Station to those he already covers, i.e. Dart, Salcombe and Plymouth. The RNLI Dart Fundraising team, under the chairmanship of Bob Gilbert, are due for a busy summer. D class inshore lifeboats are usually replaced after around 10 years of active service. The Spirit of the Dart, D 702, donated by Mike Felton and Caterfood, went into active service on 2 August 2008 and has been launched on active service 351 times up to 31 January 2019 and saved 11 lives. The generous couple funding the new replacement D class at Dart are doing so in memory of her late aunt. They are particularly delighted to be able to support the Dart station as they used to live in Dartmouth. Their commitment to the station also extends to funding the crew kit and training, which is wonderful. The donors have planned to visit the Isle of Wight to see their boat, D 838, in production. This has been scheduled to take place at the end of May. She will have her sea trials in the second week of June and then be delivered by road to the Dart lifeboat station. Her Naming Ceremony on Coronation Park on Sunday 4th August will be the highlight of RNLI Dart Lifeboat week which runs from 1st to 8th of August. The donors will hand over the boat to a senior representative of the RNLI who will then present her to RNLI Dart. The boat will then be named Dudley Jane by the Donors, blessed by the RNLI Dart Chaplain and launched. The BRNC RN Volunteer Band will also be playing. Other events in Lifeboat week to note are the annual RNLI Flag day on Thursday 1 August and the Fete which will be held in the Royal Avenue Gardens on Monday 5 August. On Saturday 3 Aug there will be a raft race at 3pm from the Higher Ferry to the Boat Float. The rafts will be built on Coronation Park and the race will be a trial run for the big event in Dartmouth Regatta. If you can help in any way with respect to the Flag Day and Fete or would consider becoming part of the RNLI Dart fundraising team, please contact Bob Gilbert on his mobile 07721 780235. If you are under 65, live within 20 minutes of the lifeboat station and have a good knowledge of the local waters, there is a vacancy for an additional Deputy Launch Authority to join the team. Please contact Mark Strudwick, Lifeboat Operations Manager, to find out more. All contact details can be found on the local station website www.dartlifeboat.org.uk There is also a link to past issues of Dart D’Tales, including the August 2015 issue which has a full article on building lifeboats, both D and B classes, at the RNLI Inshore Lifeboat Centre. Photo: Riki Bannister RNLI Dart Assistant Lifeboat Press officer. Dart RNLI’s trial B class Atlantic 75 lifeboat arrived on station last Wednesday (19 September) ahead of a two-year trial period. The lifeboat Joan Bate was on service at Salcombe RNLI until January 2018, where she launched 282 times and saved 11 lives during her 14 year service. The B class Atlantic 75 class lifeboat is the fastest in the RNLI’s fleet, with a top speed of 35 knots. It’s designed as a very capable fast response craft able to operate in more challenging sea conditions and has a greater night capability than the smaller D class. The D class lifeboat will remain on service throughout as Dart’s permanent lifeboat. A review was carried out in 2017 and indicated a potential need for a B class lifeboat stationed at Dartmouth based on the number and type of incidents that the station has responded to over the last five years. The review considered the number and types of rescues carried out by each lifeboat, changing trends and water use within the area, search and rescue demands, costs, as well as future needs. 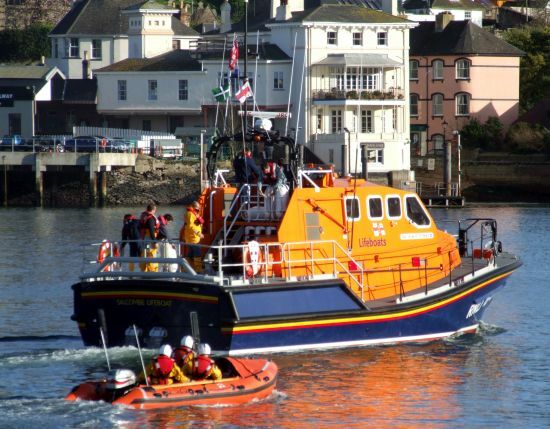 As part of this review, both Dart and neighbouring Torbay and Salcombe lifeboat stations were involved in feeding into the review to help build an all-round picture for consideration. The trial will begin officially once all volunteer crew have been trained and assessed in using the new vessel, expected later this autumn. Haydn Glanvill jumped in to support the elderly man in the water. The BBC series Saving Lives at Sea, demonstrating the lifesaving work of the Royal National Lifeboat Institution (RNLI), will once again be hitting TV screens from Tuesday 21 August 2018. Broadcast at 8pm on BBC2. The popular 10-part documentary series features real rescues carried out by the charity’s lifeboat crews and lifeguards around the UK and Ireland.The first episode will be shown on Tuesday 21 August at 8pm on BBC Two and will feature, among other stories, a dramatic rescue of a fisherman swept overboard, a stunning show of bravery as a father is saved by his teenage son, and a race against time to save a woman trapped by the tide on top of her car. The second episode, which follows in the same week on Thursday 23 August, sees a teenage girl with potentially life-changing injuries rescued following a watersports accident, as well as a stranded kayaker and an elderly man falls into the water at 11pm in Dartmouth harbour. This rescue; Launch 341 “Man in the water at Hoodown” took place on 23 September 2017. You can see how we told the story on the local station web site www.dartlifeboat.org.uk and finding it under the launches tab. Filming took place over the past year, with lifeboat crews and lifeguards carrying special cameras and welcoming film-makers into their day-to-day life. Rescues from the RNLI’s archives are also revisited, and we get a glimpse into the everyday lives of the thousands of men and women who give up their time to save lives. Last year alone, RNLI lifeboat crews around the UK and Ireland launched over 8,400 times, assisting over 8,000 people, while the charity’s lifeguards responded to 17,414 incidents and saved the lives of 127 people on some of the UK’s busiest beaches. Saving Lives at Sea will be broadcast on BBC Two and will continue throughout August, September and October. There will be two RNLI demonstrations during this year’s regatta, although unfortunately the joint working of the local lifeboat with the Royal Navy’s Sea Kings is no longer be possible. Regatta Friday 31 August 6pm. Dart D class lifeboat will be carrying out a joint rescue with Salcombe’s Atlantic 85 B class. The demonstration will take place between the Town Pontoon and the Lower ferry. Regatta Saturday 1 September 1pm. 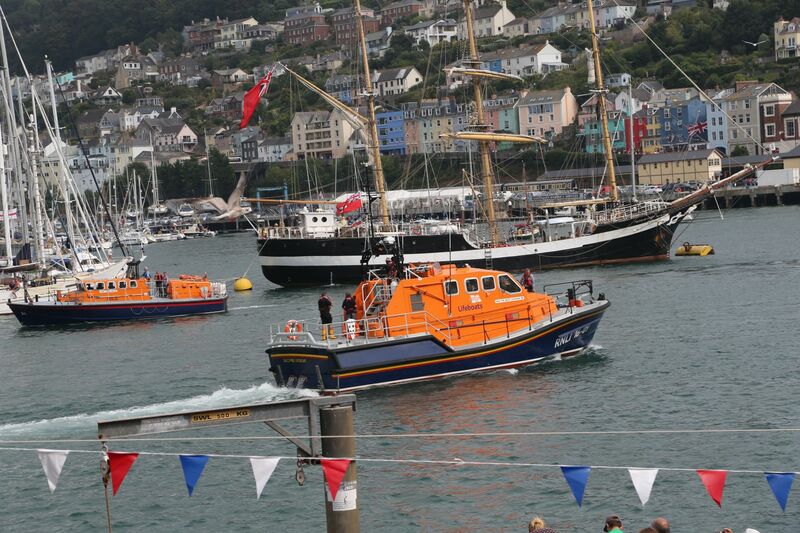 Dart D class lifeboat will be carrying out a joint rescue with Salcombe’s Tamar class all weather lifeboat. The demonstration will again take place between the Town Pontoon and the Lower ferry. Latest News Release and video on the www.rnli.org.uk web site. On 9 August we were asked to respond to a crewman with acute chest pain on a 14m fishing boat 2 miles off Dartmouth. The Coastguard paramedic was also winched aboard. Click on Magazine and then search for Dart. The video was shot with a GoPro camera mounted on Katy Locke’s helmet. The early part of the boating season was very busy; on 30 June there were three call outs in the space of five hours. 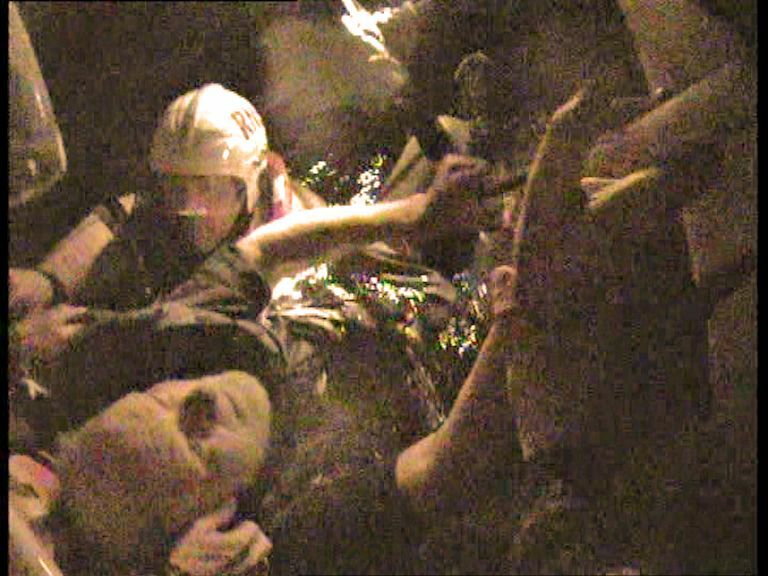 The latest shout was to assist a yachtsman lying off Blackpool Sands with a fouled anchor. Details of all launches appear on the new station web site fairly soon after the event. Videos take longer to edit and at present the helmet camera is not functioning. Last year we used the Pentax waterproof camera to film the Whale rescues so we have reverted to using that. We hope that Blast Films will use two or three of our recues for the next series of “Saving lives at sea” on the BBC this autumn. The lifeboat crew are now using every available minute to get everyone up to “competency” level on the D class before training starts in earnest on the B class lifeboat from 9 September. It is hoped to have enough crew trained up for the Atlantic 75 to become operational at the end of October. There will be two training sessions every week-night and by day on Sundays. Dart D’Tales now exists in a two page format in By the Dart. 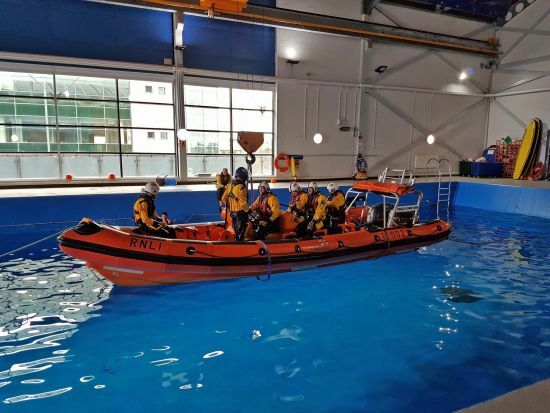 The August edition has an article on how training for the B class has already begun and Tom Shanley was filmed in a B class capsize drill in the Sea Survival Pool at the RNLI College. The video of this is on our web site. The annual RNLI Dart Fete will be on Saturday 28 July in the Royal Avenue Gardens from 10am to 3pm. Help is still needed; we can always sell cake! Whole cakes or similar can be sold on the cake stall and sliced cake can be used by Lynn Clements and her team in the Tea hut. Please bring them on the day. Bottles are needed for the Tombola. They need not all be alcohol and everything is welcome. Rob and his team will be labelling them at 6pm on Friday at the lifeboat station. Bottles are best brought just before they start or, if you have time after reading this, to the crew meeting just before 6pm this Tues. evening. Bottles can also be left at the Visitor centre before 4pm this Friday. After a quiet start to the season figures are up. Sales are 13.5% higher than at this stage last year and donations are only a little behind that. The volunteers are all working very hard and all the slots in July were filled, but there is still room for others to join the team. We have been asked to attend several outside events but this has not been possible – a few more on the rota would ease the pressure and enable us to do more. There will shortly be a new photographic presentation highlighting the activities of RNLI Dart over the last 10 years. There will be two RNLI demonstrations. 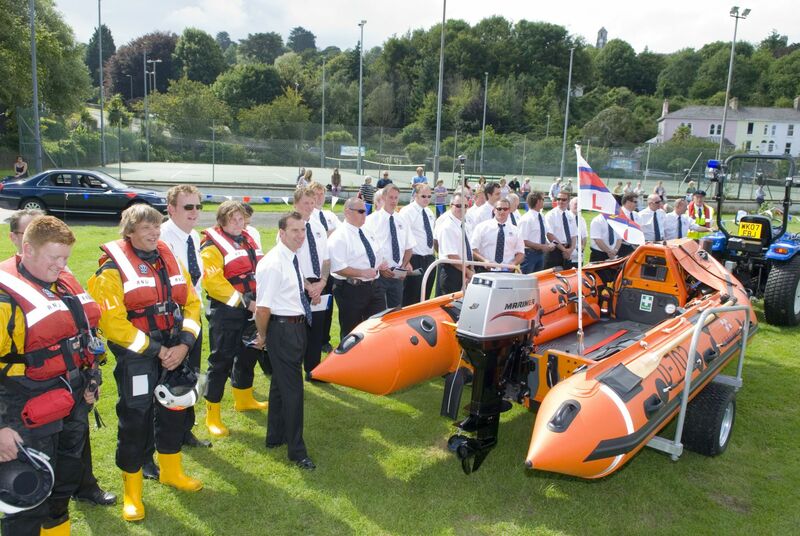 The first will be at 6pm on Friday 31 August and the Dart D class will be working with the Salcombe Atlantic 85. The Atlantic 85 was named in Salcombe in May this year, which is why their smaller Atlantic 75 became available for our trial. On Saturday 1 Sept. at 1pm Dart lifeboat will be operating with Salcombe’s Tamar class all weather lifeboat. The best place to see all this will be on the South Embankment in front of the Harbour Offices. John Fenton. RNLI Dart Lifeboat Press Officer. The Dart Operations team raised £1,200 with a Rowathon. The 24 hour event in June was opened by local man, Cayle Royce MBE. 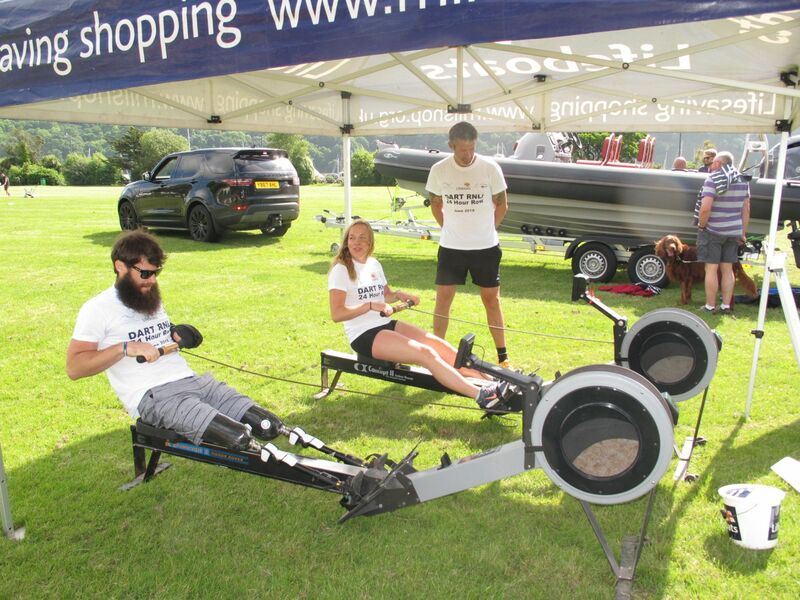 He had rowed the Atlantic three times for Service charities since being severely wounded in Afghanistan. 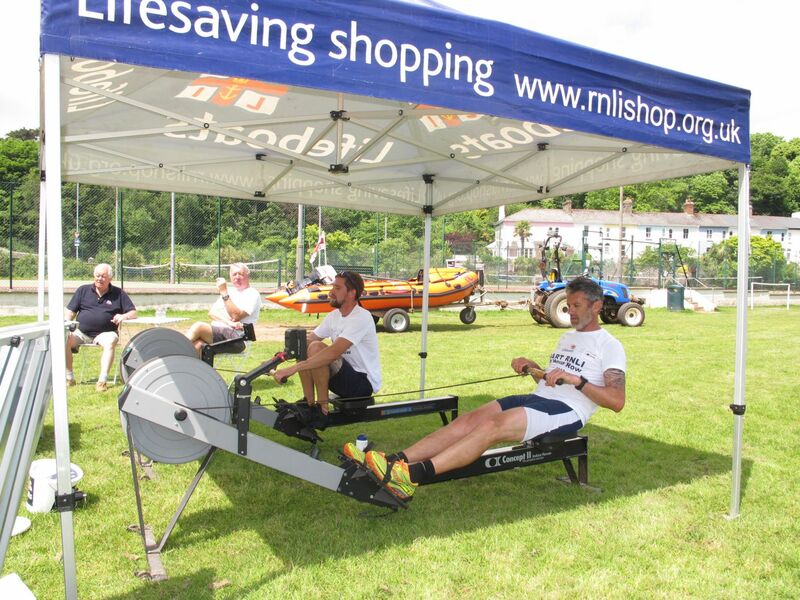 Cayle found the rowing machines used for the event quite difficult. For his most recent Atlantic row, as Captain of the Row2Recovery team, he left his legs ashore and was velcroed into his non-sliding seat. The team took 46 days to cover the crossing and the four ex-servicemen had only three non-artificial legs between them. Yorkie Lomas, a member of the RNLI Dart lifeboat crew taking part in the Rowathon and currently captain of the Dartmouth Amateur Rowing Club, took 36 days for his Atlantic crossing. He rowed with three others from Dartmouth from La Gomera in the Canaries to Barbados; a record which stood for a considerable time. Crispin Brabner, also on the Dart lifeboat crew, has recently completed this year’s extremely hot London marathon in 3 hours 34 minutes but took only 2 hours 55 minutes to cover the distance on the Rowing machine during the Rowathon. The event was arranged by lifeboat crew member Katy Locke who is also Events Chairman in the Dartmouth Fundraising Branch. The crew collected individual sponsorship for their efforts. Donations were made to the Charity by the local boat building firm RibEye as well as the Dartmouth Chiropractic Clinic. Special guest DJ, Rich Baker, also contributed and covered the 24 hour event, with a little help from his friends, and did much to keep spirits up through the long hours of the night. The Dartmouth Branch usually raises enough to cover the annual running expenses of the busy station which currently operates a D class inshore lifeboat. The crew are only too aware that fundraising activities will have to rise considerably when the ex-Salcombe Atlantic 75 lifeboat comes to the Dart this autumn to join the D class for a trial period of two years. Crispin Brabner, nearest the camera, on his way to "rowing a marathon"